"Bullets in the Bathtub" Comedy-Mystery Dinner Theater, performed by the Jest Murder Mystery Company at the Historic Lemp Mansion. Performance dates: Fridays and Saturdays, January 11th to April 13th. See website for more information. The Lemp Mansion Dinner Theater is a lively period-piece "who-done-it" that features a delicious dinner and audience participation. Public Comedy-Mystery Dinners happen every Friday and Saturday night at 7pm. See website for more details. Please call 314-664-8024 for reservations. 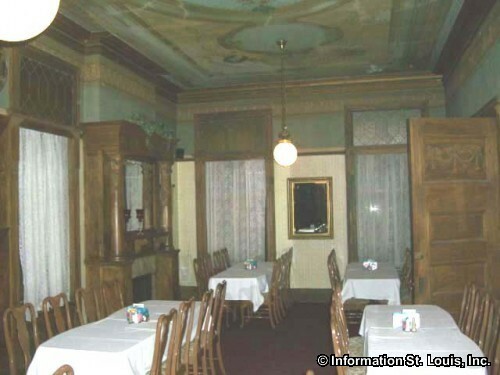 Built in 1868, the historic Lemp Mansion is now a restaurant and inn and is open for lunch, Monday-Friday, and seasonal dinner hours, plus "Family Style Dining" on Sundays. A Comedy-Mystery Dinner Theatre is held several times a year. The Mansion can also be reserved for banquets, weddings, or any special occasion. The Lemp also offers Ghost Hunting Tours for the brave of heart! Directions: From I-55, take Exit #206C/Arsenal Street and go west to Lemp Avenue. Make a left on Lemp Avenue to Utah Street. Make a left on Utah Street to Demenil Place. Make a right on Demenil Place. The Lemp Mansion Restaurant and Inn is on the left.